India beats Pak in Asia Cup, Amir's spell and Yuvi handling the ball !! India Pakistan matches are gripping ~ and this one indeed was, though it was a T20 without a single Six !! Mohammad Amir, bowled a sensational over, and at one point threatened to slice through the Indian innings. Virat Kohli played an innings of quality and earlier Pak had folded for too low a score to allow anything to happen. All credit to the left-arm pace bowler, who almost a decade ago burst into the scene, was picked as a special talent by Akram and at the peak of his career was embroiled in match fixing controversy, handed over 5 year ban, and now is back, bowling fast ! In T20 no. 512 at Shere Bangla National Stadium, Mirpur – Pak were all out for 83 – Hardeek Pandya taking 3.3-0-8-3 – then in the first over Rohit Sharma and Ajinkya Rahane both got out for ducks, then removed Raina too. Kohli made 49 off 51. Yuvraj struggled around making 14 off 32. At 15.1 Wahab Riaz hit Yuvi on the pads, the ball dropped at his feet, Yuvraj bent to pick it up and threw back to the bowler, as if in a net practice – surprisingly, Pakistanis did not appeal – it was one shot to the victory at that stage, yet, had they appealed, it was clearly out ! The rules on ‘out handled the ball’ is clear. The striker is out Handled the ball if, except in the circumstances below, in the act of playing a ball delivered by the bowler, he wilfully strikes the ball with a hand not holding the bat. This will apply whether No ball has been called or not and whether it is the first strike or a second or subsequent strike. (a) the striker will not be out Handled the ball if the strike with a hand not holding the bat is in order to avoid injury. (i) unless trying to avoid injury, as a lawful second or subsequent strike which prevents a catch. (ii) unless trying to avoid injury, after he has completed the act of playing the ball, as defined in 1 above. (iii) at any time while the ball is in play, to return the ball to any fielder, without the consent of a fielder. Such a dismissal is not new in Cricket either – the first victim was South African Russel Endean padding out to Jim Laker, ball looping off his pads and he instinctively knocking it away with hand. Andrew Hilditch was the next victim in an ill-tempered way. Hilditch picked up the ball and returned it to the bowler after a wayward throw from a fielder. The bowler, Sarfraz Nawaz, appealed for the wicket and Hilditch had to be given out, the only time a non-striking batsman was out for handling the ball. Remember that occasion in 1983 in India when Desmond Haynes redirected the ball away from the stumps with his free hand. After he was given out, ignorant Haynes who used to wear a chain reading ‘live, love, laugh’ argued with the Umpires on the dismissal. It was a big relief for Indian fan as Dhoni smashed a length ball through cover and picked up a stump as a keepsake, he may not be allowed to keep that, as this is a stump with LED ! So at 10 pm India time, India beat Pakistan by five wickets and 27 balls to spare. … yet, a chase of 84 at one stage appeared improbable ! Last month, NZ announcer Mark McLeod, who is contracted by NZC, played a cash register sound effect during one of Amir's spells during the match at Westpac Stadium. NZC CEO David White said he has since apologised to the Pakistan team, and publicly reprimanded McLeod. Amir was playing in his first international tour since being suspended for spot-fixing in 2010. Amir had a lukewarm response from New Zealand crowds upon his return. A couple of Pak players too had initially refused to share the room when his selection was announced. There is busy schedule : 11 matches in all in a league format from 24th Feb till 6th Mar – in T20 format [for the first time in Asia Cup] – quickly followed by 35 matches from Mar 8 to Apr 3 – ICC T20 World Cup 2016. The news is Mumbai has won the Ranji Trophy again. For those who do not know history much, Ranji Trophy is a domestic first-class cricket championship played in India between different city and state sides, equivalent to the County Championship in England and the Sheffield Shield in Australia. The competition is named after Kumar Shri Ranjitsinhji (Jam Sahib of Nawanagar, also known as "Ranji") This Indian King born in 1872 played in Tests for the English Cricket team and also first-class cricket for Cambridge University, and county cricket for Sussex. Neville Cardus described him as "the Midsummer night's dream of cricket Ranji trophy was inaugurated in 1935 by the Maharaja Bhupinder Singh of Patiala. Today, the Ranji Trophy final was delicately poised at the start of the third day. By lunch, it was dead and buried. Mumbai's first-innings lead was 33 when No. 11 Balwinder Sandhu joined Siddhesh Lad; by the time they finished, 33 became 136, aided by poor catching and defensive tactics from Saurashtra. Whatever happened after that was a futile attempt at damage control as Mumbai knocked the stuffing out of Saurashtra and sealed their 41st Ranji Trophy title with an innings win. Of their 45 appearances in the finals, Bombay has won 41; followed by Karnataka 8; Delhi 7 and Baroda 5. Not many would have followed the fortunes of the 27 teams. A 28th team from Chhattisgarh will take part in the tournament from the 2016–17 Ranji Trophy. Another match which would have gone unnoticed is the T20 series between India and Sri Lanka. India Women's spinners stifled the Sri Lanka Women batting, squeezed them to 89 for 9 in their 20 overs, before the top three knocked off the target in 13.5 overs to complete a nine-wicket thumping in the third T20I in Ranchi. The win secured a 3-0 series sweep for India. More to follow ~ from Mar 15 to Apr 3, there will be 23 matches played between Australia, Ireland, New Zealand, South Africa, Srilanka; Bangladesh, England, India, Pakistan and West Indies. The women T20 WC 2016. Right from the toss, the gentlemen in the middle with white coats with authority to decide are of seminal importance – the finger going up, signalling or ordering the batsmen to trudge back towards the pavilion. In ICC Women’s World Cup India 2013, there was Kathy Cross from New Zealand, only female umpire officiating. On 10th Feb 2013, she stood in the match between Sri Lanka Women and Australia Women; as also in the match between WI and Australia. This year, two female umpires are set to officiate at the Women's World T20 for the first time in the tournament's history. Kathy Cross and Claire Polosak have been named in a 31-person list of officials for the concurrent men's and women's events in India. Cross, from New Zealand, has prior experience of an ICC event, Polosak, however, will be making her first appearance in a global tournament, having overseen the women's World Cup qualifiers in Thailand recently. At 27, will be the youngest official on duty in India, with her first match coming at Mohali on March 18, when New Zealand take on Ireland. 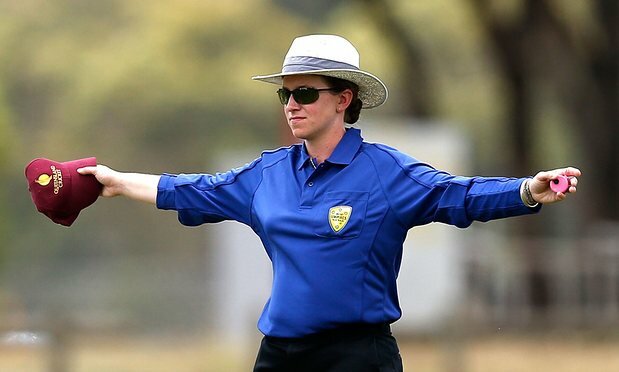 Sydney-based schoolteacher by profession, Polosak made another slice of history last year when she became the first woman to officiate in Australia's Matador Cup, standing as third umpire for Queensland v Cricket Australia XI in October 2015. The World T20 2016 could only feature seven venues – Chennai the famous MA Chidambaram stadium is left out, with the 3 locked stands being cited as reason. However, it is one of the venues for Women T20 WC. ## that list of Sind and … are some of the teams which had participated in Ranji but are defunct now ! SYMA celebrated its 25 complete years of Medical service in a grand function at Terapanth Bhavan on 2nd Oct 2015. From the humble beginning, SYMA has come a long way since ~ many people like you have helped us in big way and have ensured that we have grown, serving more people. The occasion provided us the opportunity to acknowledge gratefully the services of all those Doctors, volunteers, donors and others ~ full details of the function where we had Dr J Radhakrishnan IAS as our Chief Guest would follow in our forthcoming issues. Thanks to all of you – do continue to provide your feedback on Bliss and any other activity of SYMA – through e-mail / phone. Guantan prison closure !! ~ Ramon Castro is dead. Do you know Castro ? President Barack Obama announced on Twitter that he's going to Cuba next month, which will be the first time a sitting president has visited the country since 1928. The US recently restored diplomatic relations with the communist country after a 54-year break. Cuba's tourism boom continues at a record pace but is expected to cool off during 2016 with the government forecasting nearly 6 percent growth this year after a 17 percent increase in 2015. Amid the international buzz surrounding the country's detente with the United States, Cuba received a record 3.5 million visitors in 2015, then set another record for any single month in January 2016, officials said. The influx has pushed capacity to the limit and forced many tourists to scramble for hotel rooms, raising questions about how Cuba will absorb additional visitors when scheduled U.S. commercial airline service starts this year. That has created a flutter ~ Republican presidential candidate Ted Cruz said that President Obama is pushing to shutter the Guantánamo Bay, Cuba, detention facility as final gift to the Castros before leaving office. "I believe that President Obama intends to try to give the Guantanamo naval facility to Raul and Fidel Castro as a parting gift," Cruz told a couple hundred voter in Nevada, according to The Washington Post. "Four decades ago, Jimmy Carter gave away the Panama Canal. We built it, we paid for it, and then a feckless left-wing president gave it away to undermine this country. Well, Mr. President, you don't have the authority to give away vital military assets!" Cruz added, according to the newspaper. Republican presidential rival Marco Rubio, also campaigning in Nevada on the day of the GOP caucuses, mentioned the possibility of the military prison ending up in the hands of the Cuban government. "This makes no sense to me," Rubio told supporters at a rally in Las Vegas. "We are not giving back an important naval base to an anti-American communist dictatorship." The White House has repeatedly indicated such a move is off the table, but the Republican senators — both of Cuban descent — are using the opportunity to criticize the president ahead of his visit to Cuba in March. Cuba, is a sovereign state comprising the islands of Cuba, Isla de la Juventud and several archipelagos in the Caribbean Sea. The capital and largest city Havana. Prior to Spanish colonization in the late 15th century, Cuba was inhabited by Amerindian tribes. It remained a colony of Spain until the Spanish–American War of 1898, which led to nominal independence as a de facto U.S. protectorate in 1902. Dictator Fulgencio Batista was ousted in 1959 , which afterwards established a government under the leadership of Fidel Castro. Since 1965, the country has been governed by the Communist Party of Cuba. Guantanamo Bay Naval Base (also called GTMO because of the airfield designation code or gitmo because of the common pronunciation of this code by the U.S. military is located on 45 square miles (120 km2) of land and water at Guantánamo Bay, Cuba, which the United States leased for use as a coaling and naval station in 1903. The Cuban government has consistently protested against the U.S. presence on Cuban soil . 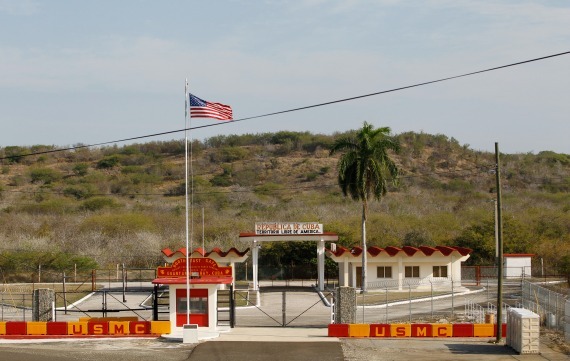 Since 2002, the naval base has contained a military prison, the Guantanamo Bay detention camp, for unlawful combatants captured in Afghanistan, Iraq, and other places during the War on Terror. Ramon Castro, the older brother of former Cuban leader Fidel Castro and current President Raul Castro, had died at age 91, Cuban state television reported on Tuesday. Ramon Castro, brother to Cuban leaders Fidel and Raul Castro, has died, a government-run newspaper reported Tuesday. He was 91. 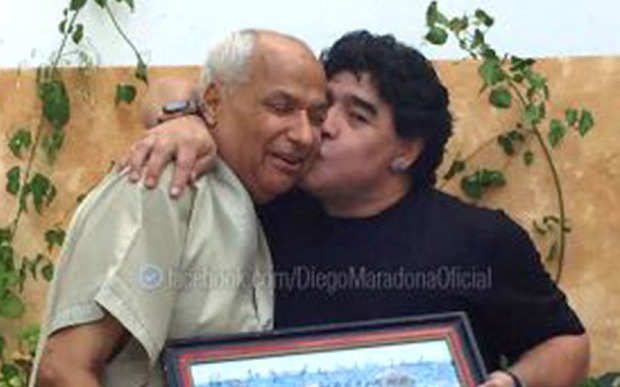 The oldest of the three Castro brothers, Ramon was born in 1924 according to a death notice printed in Granma Internacional, a government-owned newspaper. His two brothers are more well known. Fidel Alejandro Castro Ruz (Fidel Castro) the revolutionary, governed the Republic of Cuba as its Prime Minister from 1959 to 1976 and then its President from 1976 to 2008. Politically a Marxist–Leninist and Cuban nationalist, he also served as the First Secretary of the Communist Party of Cuba from 1961 until 2011. Raúl Modesto Castro Ruz (Raul Castro) has been President of the Council of State of Cuba. Raúl Castro was a rebel commander during the 1950s; after his brother Fidel Castro took power, Raúl Castro was one of the most important figures in the party, serving as Minister of the Armed Forces from 1959 to 2008, the longest to serve in such a position. Raúl Castro was officially elected as President by the National Assembly in Feb 2008, after Fidel Castro, who was still ailing, announced his intention not to stand for President again on 19 February 2008. He was re-elected President on 24 February 2013, and shortly thereafter announced that his second term would be his final term and that he would not seek re-election in 2018. During the ‘Jubilee Test’ back in February, 1980, England were in dire straits when Taylor was adjudged caught behind by umpire Jiban Dhan Ghosh off Kapil Dev’s bowling. However, captain Gundappa Viswanath asked Taylor whether he nicked it and the English batsman replied in negative. The Indian captain then recalled him ! ~ do you know that Viswanath captained India in ODI only once !! Sure you know of Cocoa bean……..most people are addicted to chocolates, made of cocoa bean.... the dried and fully fermented fatty seed of ‘Theobroma cacao’, from which cocoa solids and cocoa butter are extracted. A cocoa pod (fruit) has a rough and leathery rind about 3 cm thick (this varies with the origin and variety of pod). It is filled with sweet, mucilaginous pulp (called 'baba de cacao' in South America) enclosing 30 to 50 large seeds that are fairly soft and white to a pale lavender color. While seeds are usually white, they become violet or reddish brown during the drying process. Republic of Ghana, located in Gulf of Guinea and Atlantic Ocean, in West Africa is famous for cocoa beans. There are many popular brands. Toblerone is a Swiss chocolate bar brand owned by Mondelēz International, Inc., It is well known for its distinctive prism shape (triangular prism or pentahedron). A product recall is a request to return a product after the discovery of safety issues or product defects that might endanger the consumer or put the maker/seller at risk of legal action. The recall is an effort to limit liability for corporate negligence which can cause significant legal costs and limit ruination of the corporate image. Primarily any product can be recalled and that includes the automobiles too. An automotive recall is a way for a manufacturer to tell you that there could be something about your car or vehicle that presents a risk of injury or property damage. The recalls are intended to fix known problems with vehicles in an effort to keep roadways, the vehicle, the owner, driver and other road users safer. U.S. confectionery giant Mars has ordered a full recall of a number of its most popular chocolate bars in the UK, and several other European nations, reports MailOnline. 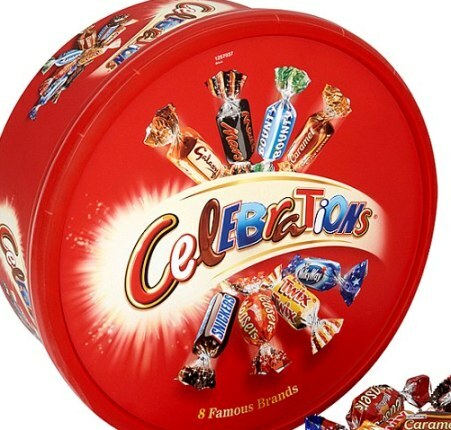 Customers are warned not to eat any Mars or Snickers bars or Celebration boxes with best before dates from June 2016 to January 2017, as they may contain plastic. The massive recall covers millions of products sold in 55 countries, including Britain, Germany, France, Netherlands, Belgium, Italy and Spain, which are all made at Mars Inc's factory in the Netherlands. The recall initially covered products sold in Germany and the Netherlands, before being extended to Britain, Italy, Spain and France on Tuesday afternoon, as well as dozens of other countries. The recall affected all Mars and Snickers products, Milky Way Minis and Miniatures as well as certain kinds of Celebrations confectionery boxes. The concerned products will have best-before dates ranging from June 19, 2016 to January 8, 2017. According to a Coordinator, there are 55 countries involved,' and the recall 'only involves the products that are made in the Netherlands', at the Mars factory in the southern town of Veghel. The move comes after a customer found a red piece of plastic in a Snickers bar bought on January 8 in Germany. After he complained to Mars, the plastic was traced back to Veghel which determined that it came from a protective cover used in the plant's manufacturing process. The food giant decided in a 'voluntary' fashion and 'out of precaution' to issue the recall which covers mostly European nations It also spreads further abroad to some countries like Sri Lanka and Vietnam, but does not extend to the United States, it is stated… web searches indicate that India is not among the countries of recall. Mars introduced Snickers way back in 1930; it was named after the favourite horse of the Mars family. The Snickers candy bar consists of nougat, peanuts, and caramel with a chocolate coating. Getting back to the Q on Vishwanath, he was at the helm for only once – in ODI no. 117 at Hamilton on 15th Feb 1981 when New Zealand beat India by 57 runs. what is the colour of black money ~ it helped Indian economy says !!! Come March, the salaried Indian middle class gets a different stress ! – Employers would be deducting tax at source; many would have assured saving in specified schemes X amount, trying to have some IT exemption – at the 11th hour would find that they could not save ! ~ interestingly some would borrow to save !! Often the talk dwells on ‘black money’, nay not the colour of money. Sometime back …. 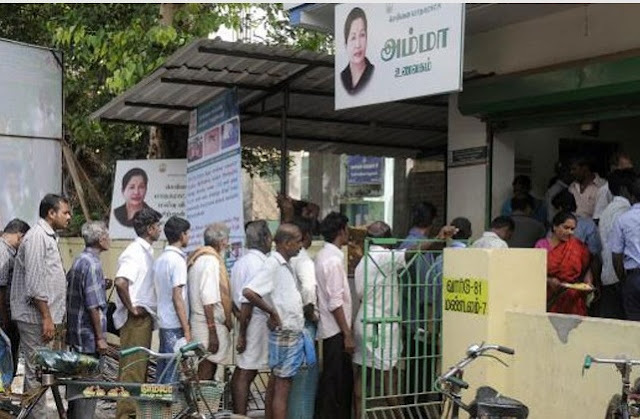 ‘a YYY group gave crores of loan, free of interest to that Eye hospital, which one were seeing at every corner that time. It also gave substantial amount of Rs 40 cr in cash — that is, black money — ‘all on a single day’, ‘as a single transaction’ – the cash reportedly found its way to an influential politician who was an ex Central Minister… Corruption, hoarding of money, black money and stashing money in foreign banks have been haunting the Nation and have been the themes of many blockbuster films where the incidence of black money is very high ! Till a few decades ago, men lived for their pride – keeping up promises and paying back debts were virtues and somebody not able to do so would even give up their lives. Those who were unable to pay back their debts for some reasons announced their position by filing ‘insolvency petition’ [called yellow leaf-let] and those who had done so, had no honour in the society and would often commit suicide. In recent times, we often see that Companies [chit funds and others] collect public money, don’t repay and cheat the public – the owners / directors when arrested, merrily wave their hands to the media, as if they had just achieved some notable thing. In Sankar’s ‘Sivaji, the Boss’ the story line was black money…. Adiseshan played by Suman manages to put Sivaji behind the bars and hatch a plot to eliminate him. In the long climax, Sivaji fights the villain in the terrace of his medical college ~ and unravels hard currency notes stashed below the tiles………. !! …. Currency notes fly everywhere and the students start collecting them stating it was the black money paid by them for begetting seats…….in the melee, the villain gets killed in the stampede. There is no question that India has the most positive economic story on the planet. Buoyed by increased manufacturing output, India's economy grew by 7.4% in the third quarter of 2015, the fastest growth of any major country in the world. But there is a dark side to India's success, says one of the country's most eminent economists. I certainly feel like agreeing to this – but just read on the article that appeared in BBC. Kaushik Basu, the chief economist of the World Bank and former chief economic adviser to the Indian government, says the nation's tradition of petty corruption helped India avoid the worst of the banking crisis that has crippled most other large economies in the last few years. It is an extraordinary claim for such an influential figure to make but, as he says in his new book, An Economist in the Real World, "economics is not a moral subject". His argument is that the pervasive use of "black money" - illegal cash, hidden from the tax authorities - created a bulwark against a crisis in the banking sector. Mr Basu says dirty money saved India from the financial crisis that engulfed the rest of the world. 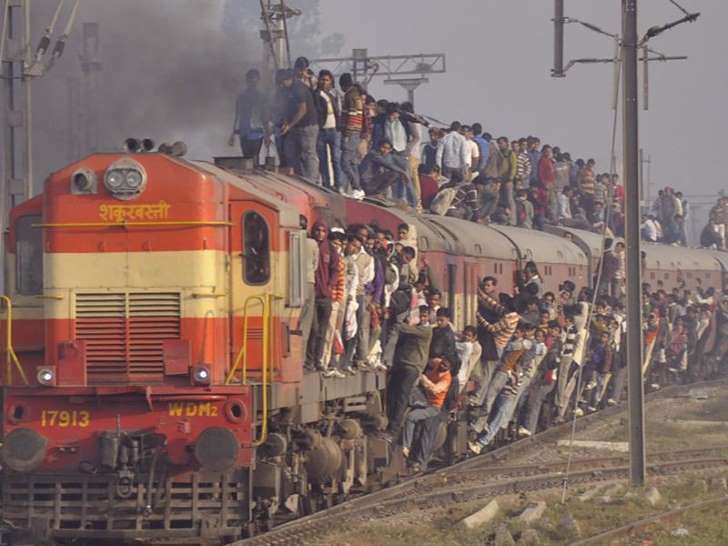 Back in the last years of the noughties India's economy was looking just as frothy as the rest of the world. It had been growing at an astounding 9% a year for the three years to 2008. What's more, India's growth had been fuelled, at least in part, by a dramatic housing boom. Between 2002 and 2006 average property prices increased by 16% a year, way ahead of average incomes, and faster even than in the US. The difference in India is that all this "irrational exuberance" did not end in disaster. There was no subprime loans crisis to precipitate a wider crisis throughout the banking sector. So the big question is why not. There were some shrewd precautionary moves by India's central bank, concedes Mr Basu, but he says one important answer is all that dirty money. In most of the world the price you pay for a property is pretty much the price listed in the window of the local realtor or estate agent. Not in India. Here a significant part of almost all house purchases are made in cash. And because the highest denomination note in India is 1,000 rupees, ($15; £10) it isn't unusual for a buyer to turn up with - literally - a suitcase full of used notes. Let's say you like the look of a house that is for sale. You judge it is worth - for argument's sake - 100 rupees. The chances are the seller will tell you he will only take, say, 50 rupees as a formal payment and demand the rest in cash. That cash payment is what Indians refer to as "black money". It means the seller can avoid a hefty capital gains tax bill. Buyers benefit too because the lower the declared value of the property, the lower the property tax they will be obliged to pay. What it also means is that Indians tend to have much smaller mortgages compared to the real value of their properties than elsewhere in the world. At the peak of the property boom in the US and the UK it was common for lenders to offer mortgages worth 100% of the value of the property. Some would even offer 110% mortgages, allowing buyers to roll in the cost of finance and furnishing their new home. That's why when the crash came, the balance sheets of the big banks collapsed along with property prices. In India, by contrast, mortgage loans can only be raised on the formal house price. So, says Mr Basu, a house worth 100 rupees would typically be bought with a mortgage of 50 rupees or less. So when prices fell in India - and they did fall in 2008 and 2009 - most bank loans were still comfortably within the value of the property. That's why India managed to avoid the subprime crisis that did so much damage elsewhere. India did experience a slowdown, but it was collateral damage from the global recession rather than the result of any national problem. Indeed, within a year India had begun to pull out of the crisis, returning to growth of almost 8% a year between 2009 and 2011. That is not to say that Mr Basu approves of petty corruption. Basu says only those who take bribes should be held criminally responsible. He compares it to the effect of an unpleasant disease: it may have some positive side effects - encouraging your hair to grow, for example - but you would still prefer not to have the illness. Indeed, Mr Basu is famous for having devised a particularly clever and characteristically radical way of rooting out corruption - legalising bribery. A few years ago, he proposed that instead of both bribe-givers and bribe-takers being held criminally responsible for their actions, only the bribe-taker should face sanctions. It is a simple change, but radically alters the relationship between the two parties. It means people who give bribes no longer have a shared interest in keeping their nefarious activity secret. Freed from the risk of prosecution, bribe-givers would have a powerful incentive to reveal corruption. Unfortunately, says Mr Basu, his innovation has still not found its way into mainstream Indian law. ….. what is your take on this ? “Ro-Ro” is an acronym for Roll-on/roll-off, specialised Carriers that transport wheeled cargo, mainly new automobiles. The ro-ro ship is different from lo-lo (lift on-lift off) ship that uses a crane to load the cargo. The vehicles in the ship are loaded and unloaded by means of built-in ramps. Normally these ramps are made towards the stern (backside) of the ship. These vessels are slightly odd-shaped and in recent years, one can spot such vessels from Marina beach. India has a lengthy coast line. Our coast spans from the south west Indian coastline along the Arabian sea from the coastline of the Gulf of Kutch in its western most corner and stretches across the Gulf of Khambhat, and through Mumbai, Konkan, Canara, Mangalore, Malabar, to Cape Comorin, into Southern India aong Coromandal Coast. Our Nation has a coastline of7,517 km (4,671 mi). There are so many ports in Gujarat ~ some are administered by Private. Gujarat Maritime Board, is the statutory body of State Government of Gujarat, which responsible for management, control and administration of 44 ports in Gujarat State. Port Pipavav, India’s first port in the private sector, is a port on the West Coast of India for containers, bulk and liquid cargo. Its lead promoter is APM Terminals, one of the largest container terminal operators in the world. APM Terminals recently announced having hosted the maiden call by leading RORO operator Höegh Autoliners vessel – m.v. HOEGH ANTWERP at Pipavav Port. HOEGH ANTWERP berthed at Pipavav Port in late January, 2016, to load Ford’s small and midsized cars, being exported from its Sanand plant in Gujarat. Norway-based Höegh Autoliners is a leading global provider of transportation and logistics services within the RoRo segment. It has large fleet of vessels for Pure Car and Truck Carriers (PCTCs) sailing in global trade systems. In August 2015, APM Terminals Pipavav commenced operations of its RoRo facility and successfully berthed its first RoRo vessel m.v.Grand Dahlia at the port. Over 10,000 cars have been shipped from Pipavav Port since the commencement of the RoRo facility. 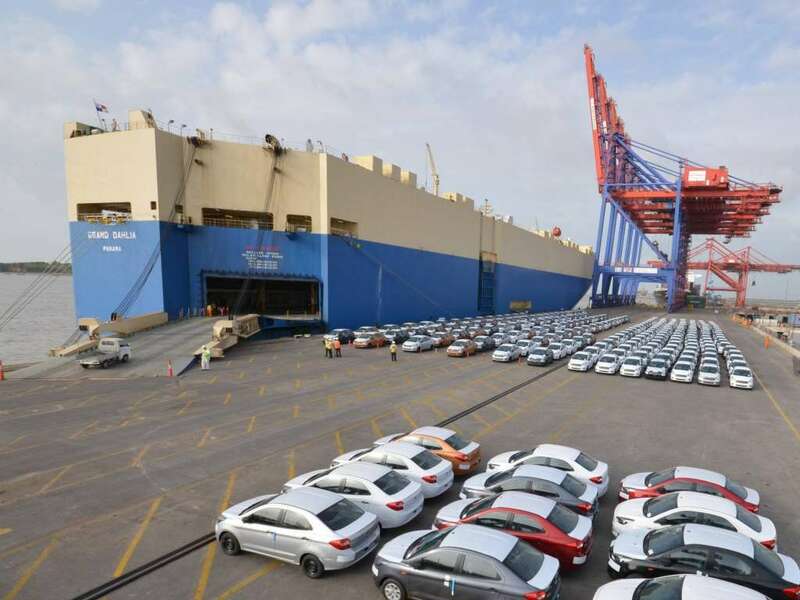 The first shipment was of 1,380 new Ford Figo Aspire vehicles loaded on to ‘Grand Dahlia’ vessel. Hyundai Santro was launched in Sept 1998 and was a runaway success. Within a few months of its inception HMIL became the second largest automobile manufacturer and the largest automobile exporter in India. Hyundai has a manufacturing facility near Sriperumpudur in Tamilnadu, closer to the Capital and Port at Chennai. Hyundai exports cars to foreign countries and cars do roll out to other parts of India – it is very usual to see so many specialised trucks waiting for loading cars. The interesting news is - Hyundai Motor Company is now using ships to move its cars across domestic markets to save on costs and reduce carbon footprint. As many as 800 cars were loaded on to the M.V. IDM Symex, a roll-on-roll-off (RoRo) vessel, at the Chennai Port recently and the vessel sailed for Pipavav Port. Though Hyundai had been using Chennai Port for exporting cars, this is the first time it is transporting its cargo through the sea for domestic market. 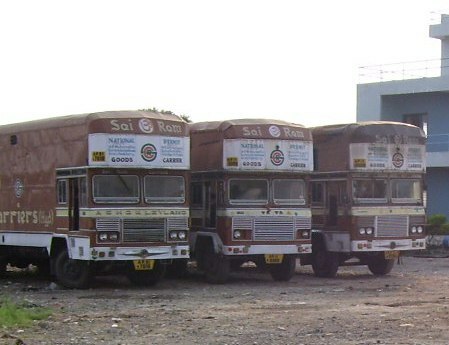 Trade sources said it takes normally three to four days for the car manufacturer to move vehicles from the production centres near Chennai to Gujarat region through trailers. 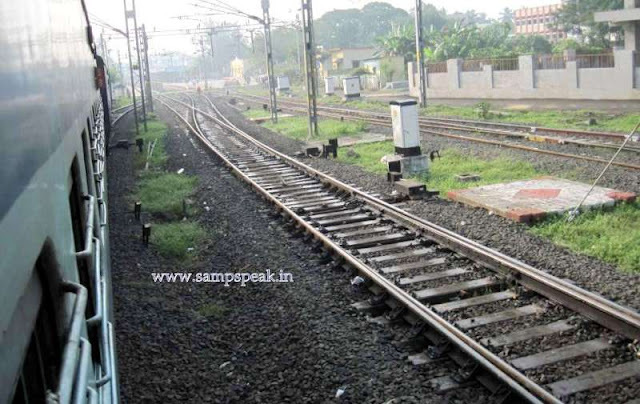 However, shipping them is seen as eco-friendly and low-cost as the Centre had promised to provide incentive of Rs.3,000 per car to those using coastal route. The Hindu reported that after flagging off the maiden service, Chennai Port Trust officials are also talking to other OEMs such as Nissan and Ford to start using the coast for transporting cargo. The Port Chairman is quoted as stating that to encourage the OEMs to use the Port services, they announced a flat wharfage rate of Rs.500 per small car and Rs.2,000 for big cars. Kamarajar Port, which recently overtook Chennai Port in car exports, is also reportedly thinking in a similar direction. The news report adds that Vessel owner Symex Maritime Inc. has been granted permission by the Directorate General of Shipping to carry out coastal run for five years. IDM Symex will be used to transport cars manufactured mainly by Hyundai and other manufacturers. To make it viable, Symex is in discussion with exporters and importers to ship other commodities during the return trip to Chennai. Reportedly an earlier attempt was not so successful. It is now sated that moving cars by coastal shipping would be 25 to 30 per cent cheaper when compared to road. It is pollution free, as nearly 100 car trailers would be off the road. According to government estimates, a diversion of 5 per cent of cargo transportation to a waterborne mode can result in an annual saving of Rs.2,000 crore and a reduction of 6 per cent in harmful chemicals and pollutants. Commodities carried by coastal shipping include thermal coal, crude oil, iron ore and cement, and this has not changed over the years. A web search reveals that APM Terminals Pipavav received its first domestic Ro-Ro shipment of 800 Hyundai cars recently. The development follows Ministry of Shipping's decision to relax cabotage regulations on special vessels … lot happening out there, on the sea and at ports.